Regular readers of my blog, and those that know me, know that I’m not a fan of winter so now, with summer in full swing, I’m in my element. There are lots of outdoor events happening in Radovljica and across Slovenia and plenty of opportunities to get out hiking in the mountains and on my bike. I love the summers in Slovenia- I just wish they were a bit longer and the winters a bit shorter! In the northwest of Slovenia where I live, the alpine region, hot summer days rarely seem to pass without an afternoon thunder storm or two but they usually only last a matter of minutes. Therefore, if you are planning a trip to the mountains or bike rides, picnics etc. my advice is to always pack your waterproofs and I usually aim to go early to be back before the storm clouds gather. There was a quite spectacular electric storm last night which I was rather glad to be watching from inside rather than out! Despite the high temperatures, there are still areas of snow in the high mountains where it is necessary to take extreme care and be well-equipped. Additionally, just for information for anyone planning walks in the Julian Alps, I have just read that due to rock fall, the path from Kriški podi to Planja and Razor is totally closed. On Saturday morning I went for a long bike ride on the Radovna Cycle Path (see my June 2013 blog ‘Churches galore and the Radovna Cycle Path’). 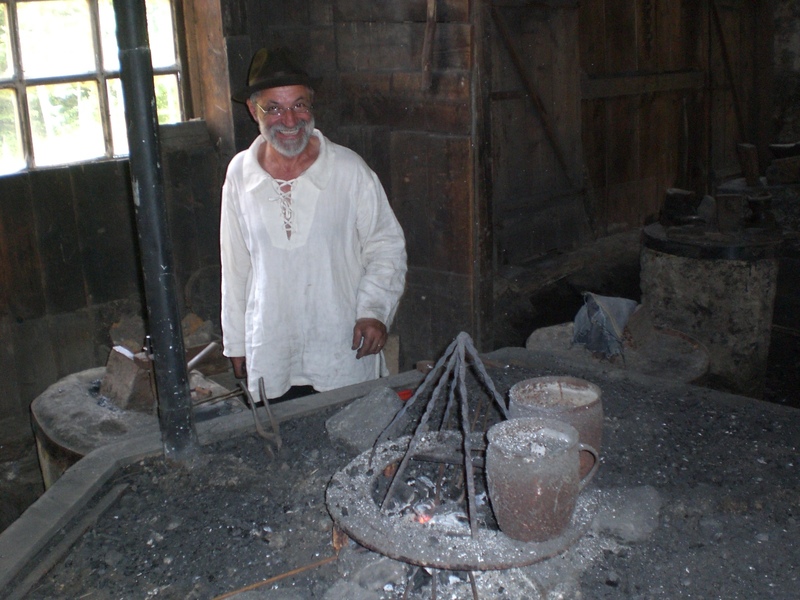 Later, in the afternoon, I visited the annual Blacksmiths Festival in Kropa. The picturesque village of Kropa, the cradle of Slovene iron-forging, is nestled into a narrow valley at the foot of the Jelovica plateau. 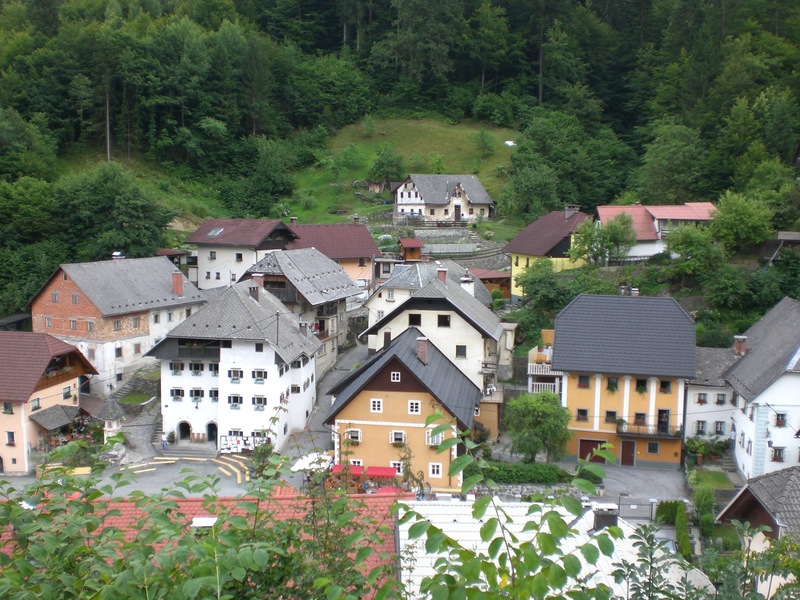 The small village is crammed with interesting and authentic sights, unique architecture, preserved technical heritage and the roaring waters of the Kroparica stream which runs through the village centre. 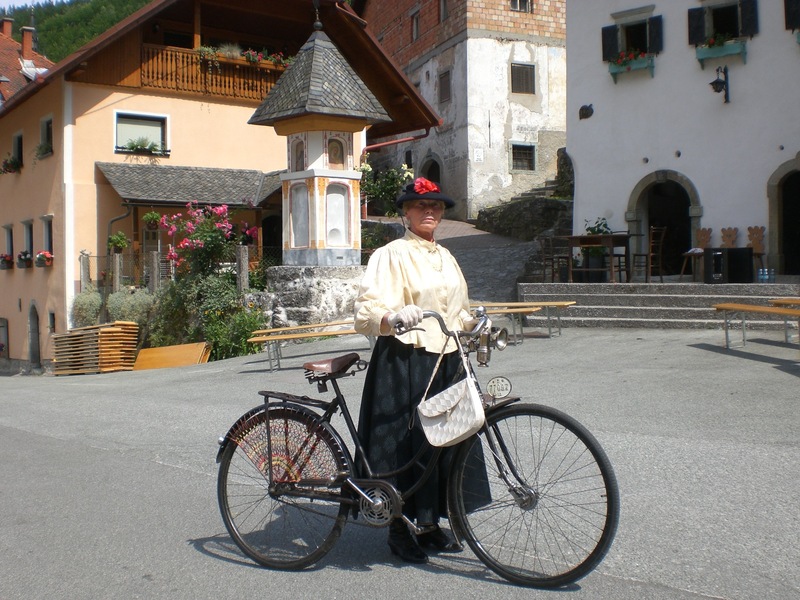 I attended the festival on its main day, Saturday, and timed my visit perfectly to watch the old-timers bike parade. In addition I watched demonstrations of hand forging of nails in the Vigenjc Vice Blacksmith Museum, browsed the handicrafts market, watched local artists at work, visited the Blacksmiths Museum and the Fovšaritnica Museum House and the open-day at the headquarters of UKO Kropa Ltd, who specialise in made-to-order wrought iron forging e.g. home accessories, balconies, railings, door handles, candelabras etc. and also have a small shop onsite where visitors can purchase a variety of smaller items and gifts. I got up early on Sunday morning with the intention of a long hike to Stol, the highest mountain in the Karavanke range. However, it was raining so I went back to bed! Not for long though, by 8.30am the rain had eased to leave a strange, hot and very muggy day and I then set off for a bike ride and walk to Valvasor. Sunday afternoon was spent in an unusually relaxing way for me, watching the Wimbledon tennis final, though the nail biting match was actually far from relaxing! Finally after 77 years of waiting Britain has a new champion – well done Andy Murray!